Maestro String Set for Violin – G (dark red – silver wound on perlon), D (red – aluminium wound on perlon), A (Organge – aluminium wound on perlon) and E (Yellow – German steel, ball end). 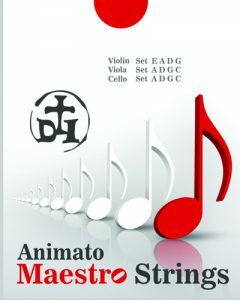 The founder of Maestro Strings is Dietrich Lasa, seasoned string player who has been in the string instrument business since 1970 as touring performer and member of Chamber Orchestras (Tibor Varga Chamber Orchestra, Stuttgsrt Chamber Orchestra), Symphony Orchestras, as a teacher (primary, secondary, tertiary levels) and string business expert. We believe that the Maestro Strings for violin, viola and cello are fine alternatives to Western, higher priced strings.